England coach Eddie Jones has, predictably, started the mind games early ahead of Scotland’s Triple Crown-chasing visit to Twickenham a week on Saturday by questioning if Vern Cotter’s side can handle the “expectations of a nation”. Scotland’s rousing 29-13 win over Wales at BT Murrayfield on Saturday means they head into the last two rounds of the Six Nations Championship as genuine title contenders, while England overcame Italy 36-15 to keep their hopes of a back-to-back Grand Slam and record-equalling 18th successive Test victory in play. “We’re looking forward to Scotland coming down,” said Jones after yesterday’s match at Twickenham. “They’re talking big already, they’re on a roll, they’re confident, but they’ve got to carry round the expectations now for the whole Scotland nation for the next two weeks before they come down and play us. Scotland will be going into the third leg of a possible Triple Crown, which is achieved by beating all three home nations, with a live chance for the first time in 21 years and hoping to win it for the first time since 1990, when the Grand Slam-winning side achieved the feat for a tenth time. The small matter of beating England on their home patch for the first time since 1983 – which was before any of the current Scotland Six Nations squad were born – stands in their way and, while some of his players were expressing belief that a resurgent Scotland can finally lay to rest their 34-year run without a win at Twickenham, Cotter was preaching caution about a match he believes will be easily the toughest of the campaign so far. 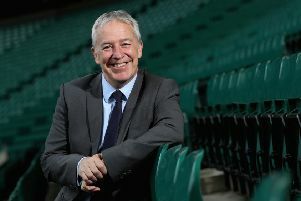 Jones, pictured, has history when it comes to trying to wind up Cotter, with the Aussie firing off in the lead up to the 2015 World Cup pool match when he was coach of Japan and then, last year, insisting that the Scots were favourites ahead of the opening Calcutta Cup clash, which was the first outing of his so far perfect tenure as England chief. Cotter, who has always endeavoured to avoid becoming embroiled in any war of words with his ebullient counterpart, said: “England haven’t lost a game for a while so we would be very cautious about saying anything. It may not be a Triple Crown decider in London as England will still have Ireland to face on the closing weekend but Jones and his men know they can draw level with New Zealand’s record of 18 successive Test match wins if they retain the Calcutta Cup. Meanwhile, Scotland have received another injury blow with the loss for the rest of the tournament of Edinburgh flanker John Hardie, who lasted less than half an hour against Wales before a knee injury saw him replaced by club-mate Hamish Watson. next month and he joins skipper Greig Laidlaw and No 8 Josh Strauss in being ruled out for the rest of the tournament. Wing Tommy Seymour sustained a blow to the ribs while scoring Scotland’s first try but was fine to continue and is not considered a concern. Lions coach Warren Gatland was watching from the Murrayfield stands on Saturday as several Scots pressed their claims for a place on the British and Irish select squad’s tour to New Zealand this summer, including full-back Stuart Hogg, locks Richie and Jonny Gray, man-of-the-match Finn Russell and Seymour. But Cotter added: “It was a team performance. I wasn’t looking at it from the Lions coaching perspective. A performance like that puts everyone in line, doesn’t it?